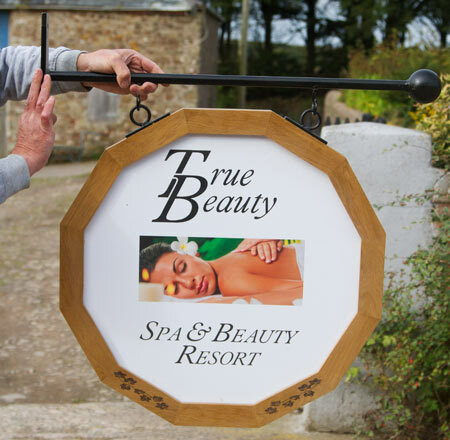 The Sign Maker for the very best in Bespoke Signs & Signage : Round Oak Framed Signs and Mirrors - Almost! These are as close to a round wood framed sign as we can get! Our carpenter who came up with the idea and he makes them in three sizes. 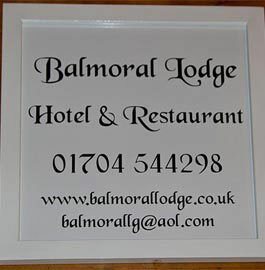 The 50mm oak frame can surround an aluminium composite sign with cut vinyl lettering or full colour exterior print. The cut vinyl is only single colour but is the longer lasting option. Gold lettering on black aluminium composite makes for a very effective sign. 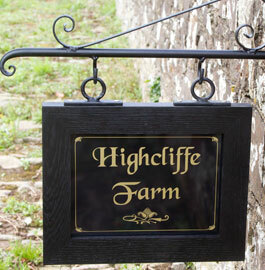 The wooden frame around the sign can be finished with a satin varnish or painted black, white or grey. If a varnish finish is chosen we can also laser words or images into the wood. Another alternative is to have a painted sign and panel. In this option the panel is made from 6mm Tricoya board. This is a wood based board made using a high performance resin. It is very stable, strong, durable and weatherproof. Tricoya itself comes with a 50 year guarantee. On top of that it is environmentally friendly. These oak framed signs can be single sided for wall mounting or double sided for hanging. Wrought Iron Hanging Brackets - We have a selection of Ball End and Scroll End wrought iron hanging brackets for the double sided hanging signs. We also have a good selection of other Hanging Sign Brackets. These are normally galvanised and then painted black. However we can paint white for an extra £10 or other pantone colours for £45. Lettering - The letters can be as small as 20mm and the cost includes up to 50 letters. Extra letters are £1.65 per 25. We have a large selection of fonts to choose from - click here. Painted letters can be black, white, silver, gold, grey and dark blue. Vinyl letters can be cut in any of our standard vinyl colours Printed lettering can be in any CMYK colour. 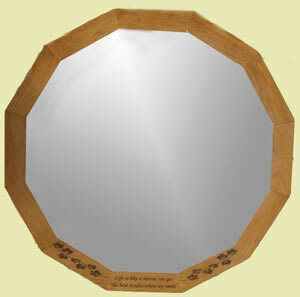 Mirrors - Having made the prototypes for these signs we realised we could also make lovely mirrors too! The costs are as follows. Made in the UK. Our team at The Sign Maker looks forward to helping you with your wooden framed sign.